Overview: The Kingdom of Bhutan is a small, landlocked nation in South Asia, at the eastern end of the Himalayas bordered on three sides India and to the north by China. Estimated population for Bhutan is just over 700,000. A majority of the Bhutanese people self-identify as Ngalops (Western Bhutanese) or Sharchops (Eastern Bhutanese). Ngalops are mainly of Tibetan origins; Sharchops are of mixed Southeast Asian and South Asian origins. 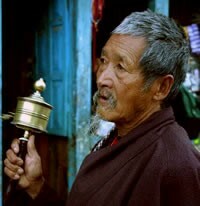 Though linguistically diverse, the people groups within the Bhutanese people cluster uniformly follow Lamaism, more popularly known as Tibetan Buddhism.